Watch this video to see how easy these are to make! I love eggs and wanted to demonstrate how perfect they are any time of day, so I came up with a bunch of recipes that go beyond breakfast and are not only affordable, but also high in protein and easy to prepare. Today's recipe is part of our week long Eggs Beyond Breakfast* series, sponsored by Safest Choice pasteurized eggs and which we started last Thursday with Mexican Fried Rice. I loved the idea of doing this series since eggs are one food I find most people always have in their refrigerators. I, for one, always have a carton or two on hand because they are one of the few ingredients that last for weeks and everyone in my family enjoys them no matter what time of day it is. One of the reasons I like Safest Choice eggs is that their shelf life is twice as long as most. Another item I keep year round is frozen puff pastry. It can transform the most simple of ingredients into something spectacular. Case in point with these Egg and Bacon Muffin Cups. They may look fancy, but they're really quite simple. You may want to keep that fact a secret so everyone will think you slaved away for hours in the kitchen making them something extra special. And if you want to make this dish even more kid friendly, let your kids squirt a dollop of ketchup on their plates to dip away. It only adds to the fun of this out of the ordinary and supremely tasty recipe. * Safest Choice is sponsoring a sweepstakes to win fabulous kitchen prizes and a year's supply of eggs for your family! Two grand prize winners will also win an autographed copy of my new book, Weelicious: One Family. One Meal. Click here to enter. Every entrant will receive a free download of printable Weelicious recipe cards featuring the full Beyond Breakfast recipe series. Also, win a year's supply of eggs from Safest Choice -- enter before October 29 -- by clicking here. 2. Unfold the puff pastry sheet and cut sheet in 6 equal pieces. Gently stretch each piece into a 5x5 inch square. 3. Place each piece of pastry in a greased muffin cup leaving a 1/2 overhang at the top. 4. 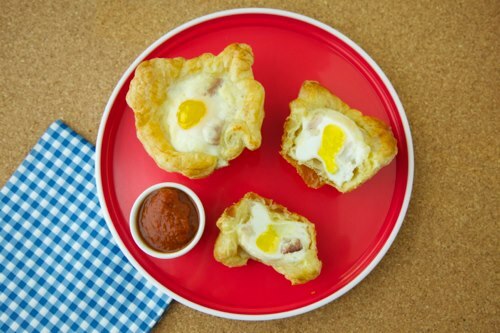 Sprinkle one teaspoon of the parmesan in the pastry lined cups, crack an egg into each cup, top with bacon, 1 teaspoon parmesan cheese, and a pinch of salt. 5. Whisk together the remaining egg and water and lightly brush pastry edges with egg wash.
6. Bake for 20 minutes, remove from oven and immediately move to a wire rack. Let cool 5 minutes and then serve. YUM! I will have to make these this weekend for Sunday Family Breakfast! Have you tried freezing the leftovers? I'd also love to know about freezing the leftovers. Sounds like something I could make on the weekends and then use a quick pop in the toaster oven breakfast during the week, maybe. YUM, these sound wonderful. My husband would love them! Do you precook the bacon? So. making. these. Brilliantly simple. Buy unfrozen puff pastry. Using stand-alone muffin cups, prep the pastry, sprinkle in some bacon. Freeze. Then when I'm ready, heat up the oven. Put the frozen muffin in for a while (keeping an eye on it/them), then when they look ready, crack the egg and let finish. What company do yout use for your puff pastries? Sometimes I find it at Trader Joe's and sometimes I use Athen's! I just made these for my kids with spinach (we're vegetarian) instead of bacon and they're a huge hit! Thanks for the recipe! Neat idea, and really tasty! I didn't have puff pastry on hand, so instead, I used biscuit dough and added leftover bbq ham, goats milk ricotta I made earlier, and cheddar. If these freeze well, they will be a huge hit at our family deer camp. They are in the oven now. So easy to make! If anyone freezes them and has success with reheating them, please post on here. I would love to know how they turn out once they've been cooked, frozen and reheated later. I didn't freeze them, but I did put them in the fridge and reheated them 1-2 at a time. They were great reheated. I cut the batch in half and they were still tasty 2 days later. Made them last night and my husband had one for dessert, one for breakfast this morning and one for lunch today! HUGE hit! I made these today for my son. They looked beautiful, but had runny yolks when I cut into them. Is this how they are supposed to be? Is it safe to feed a 15 month old uncooked yolks?? You can cook them longer if you prefer hard cooked eggs! I personally like the runny yolks, and I think it's fine for a toddler to eat! Very yummy! I made them last weekend. They were delicious and came out perfectly! I am looking forward to trying these. Any recommendations as to what other recipes I should pair these with? Awesome. Just awesome. Everyone thinks I'm a great cook because of these. Thanks so much for sharing.